Cost, flavor, and tenderness are three of the factors to consider when deciding between different steaks. It is difficult to find a steak that offers a low cost while still being tender and flavorful. These factors also come into play when comparing two popular cuts—ribeye steaks and sirloin steaks. In this BBQ Showdown, we’ll see how these two cuts rank against each other and how each of them can be better than the other in certain situations. 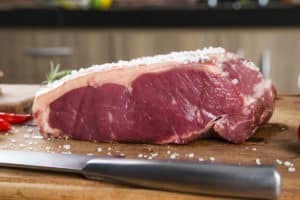 How are ribeye steaks different from sirloin steaks? Ribeye steaks are fatty, which can be a good thing since that fat brings flavor. Ribeye steaks are widely considered the most flavorful steaks. Also as a result of their higher fat content, ribeye steaks will have more calories when compared to an equivalent portion of sirloin steak. Sirloin cuts are known for one of the leanest steaks. 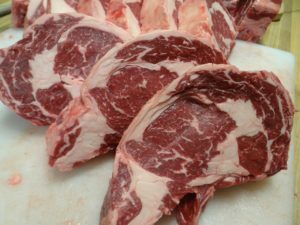 The area from which sirloin steaks come is often cut into other types of steak. For example, the T-bone steak and the top sirloin both come from the same area. Because they are lower in fat, sirloin steaks often lack the flavor that you get from ribeye steaks but their lean meat makes them very high in protein. You will get more protein from sirloin steak than you would from an equivalent portion of ribeye steak. What part of the cow provides ribeye steaks? What part of the cow provides sirloin steaks? As you might expect, ribeye steaks come from the animal’s rib area. Sirloin steaks come from the area between the rib area and the rump, behind the loin. When choosing sirloin, it is best to choose your steaks from the area closest to the loin. This is the same area from which T-bone and porterhouse steaks are taken. The high fat content of ribeyes makes them more challenging to grill. While it is possible to grill a ribeye steak, you will have to be careful and cannot leave it unattended. The problem is that the fat will melt, which will cause the flare-ups that can easily result in the meat being charred. Sirloin has significantly less fat, which means that it is less likely to drip fat so the temperature should remain relatively stable. Which cut is more expensive? Ribeye is typically the more expensive of the two options. This is because it is a popular cut and is in high demand. However, the grade of the meat increases the price as well. Prime sirloin may be more expensive per pound than Choice ribeye. Whether you opt for boneless or bone-in ribeyes will also affect the price. Boneless ribeye is typically more expensive than bone-in ribeyes, which means that you may be able to get bone-in ribeye for a little less than the price of some pricier sirloin cuts. When should you use ribeye and when should you use sirloin? Use ribeye steaks in cases where tenderness and flavor are paramount. Unless you have the time and grill-management experience to cook this over an open flame, you may want to reserve this cut for the cast iron pan. The sirloin is ideal for the grill; it can be cooked to perfection even by an amateur grill-cook. It is an especially good option for anyone needing to avoid meat with too much cholesterol.